Its Masters Week.Beautiful course and competition. Of course all eyes and interest will be on the Tiger to see if he can capture another major. Great cast of golfers vying for the green jacket. Lets have some fun. Pick(any) your for best golfers and follow through out tourney. Total low ball score wins. Pick also your favorite to win. Post by Wed 10 pm. For ex Team your for golfers hoping they all make cut and total score each day and then final on Sunday. Your Green Jacket winner. I'll go long and pick Huffman to win a play off against Krucher. Mickelson and Fowler round out my team. Tiger between 7 and 17. Its just happen that way. Woods is emotional/personal favorite. Rory & Dustin long ball hitters and Rose was among group of Spieth,Rahm,Fleetwood,Day,Fowler. Think group makes final cuts. Tiger won't make the cut. Last edited by twcpfan1; 04-10-2019, 02:32 PM. Dang, Brooks Koepka lite it up again on Thursday... Dude brings his best game in the majors!! This is my favorite sports weekend of the year! Solid and determined play by the Tiger. Comeback complete! Says it all. Greatest comeback story in sports history. 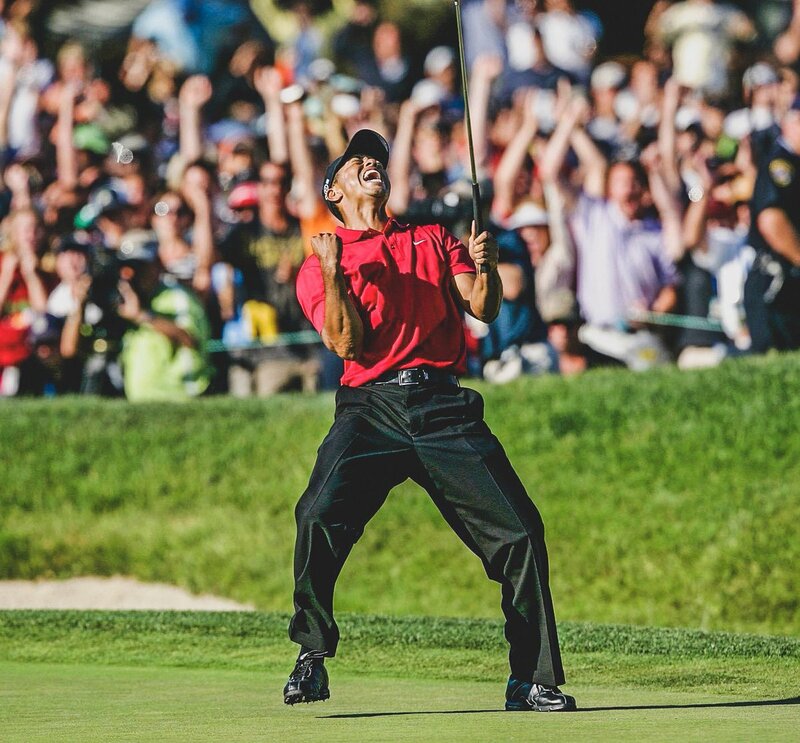 That shot on the 16th though...…..
And the chase at Ben Hogan & #82 is on and inevitable. Actually, persimmon shaft clubs, wood headed clubs with Inserts made of first generation polymers or 100% percent wood faces, leather shoes, w/metal spikes. From the clothes they wear to the type of grass on the course. It isn't the same game. Unless of course you can compare one of those WWI Fokker's to a F-16. My mom and one of my step dads were returning to El Paso from Okla. When we came upon a wreck involving a buss and Hogans car. We were diverted around the scene. It was near Van Horn but I don't think it was on hwy 80. As the El Paso times reported he saved his wife's life. The motor was in the front seat. He was between the motor and his wife. They said he would never play again. He won the US Open 18 months after the accident. Come to think of it Tiger was also injured in a car wreck. Different times, different men and assuredly a different game. Last edited by mojotrain; 04-15-2019, 04:06 PM.